After twenty years of booming business, the world’s largest auto market suffers declines. Depending on the calculation, sales fell by 2.8 to 6 percent in 2018 compared to the previous year. One of the reasons is the continuing trade war between China and the US, which led to temporary tariff increases on imported US vehicles, the tariffs were temporarily increased from 25 to 40 percent and were just recently withdrawn in December. In addition, the Chinese economy is weakening in general. The real estate market is under pressure, debt is growing, economic growth is stagnating and there is a lack of consumer confidence, which is so important to car sales. Other experts cite the many driving restrictions and lengthy and difficult vehicle registration procedures for new cars in the cities as the cause. Also, comfortable ride-hailing services were able to attract more passengers, which also dampened demand for cars. In addition, overcapacities of massively expanded production facilities are threatening the car industry. Due to years of continuous growth and good prospects last year, investments were made in new plants or their expansion. 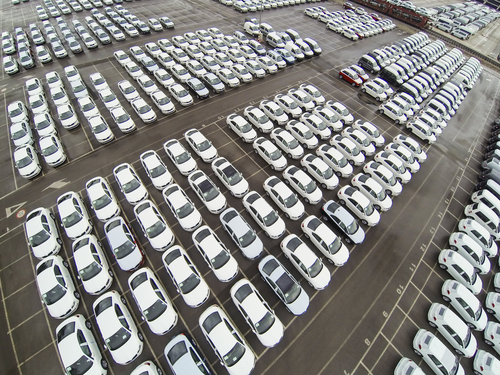 But now in 2019, overcapacity of nearly five million vehicles or idle plants of 19 percent are threatening, according to the expert Ferdinand Dudenhöffer from CAR Center Automotive Research at the University of Duisburg-Essen. The Chinese government is trying to counteract the situation and announced new regulations. For gasoline cars no new factories may be built or relocated to other provinces. For the German automakers also break harder times. In China, the most important market for the Volkswagen Group, sales fell by 9.8 percent to 274,100 vehicles. Only the VW subsidiary Audi posted a plus of 5.4 percent in deliveries. The other German premium brands such as Daimler and BMW were also able to sell more cars. Mercedes was able to grow by just under four percent, BMW is suspected similar but there were no figures published. Among the Chinese manufacturers especially Geely stood out, which are also major shareholder at Daimler, and could announce an increase of 20 percent. However, Geely as well as the industry association CAAM expects a stagnation for 2019. Nevertheless, there is still a positive environment in the area of vehicles and automotive, especially in the premium segment. Do you want to export your products to China? You might need the compulsory China Compulsory Certification (CCC), for which we would be pleased to advise you. For more information on how CCC certification may affect your company, or for more information about CCC certification in general, the process, and the associated costs, please visit our website and our News Section where you will find current updates twice a week. Please do not hesitate to contact us for further details and consultation. You can contact us via e-mail, or call us (UK: +44 2071931135, Rest of Europe: +49 69 2713769150, US: +1 773 654-2673). You can also check out our free CCC-Brochure, which can be downloaded right here as a PDF file or you consult our book (in English) “A Brief Guide to CCC: China Compulsory Certification”, which can be found directly hier on Amazon.